As its title suggests, The Lazarus Effect is a miracle: despite boasting an impressive creative pedigree, a strong cast, and an evergreen subject matter, it manages to be an absolutely forgettable dud. Far from being completely terrible but just as far from approaching greatness, it’s arguably the worst type of movie—a project that shows glimpses of promise that are snuffed out so the prepackaged product can roll off of the assembly line. In this case, The Lazarus Effect hails from the Blumhouse plant, an outfit that’s beginning to function like so much clockwork. Several familiar reference points converge here, but, at heart, this is a Frankenstein riff involving a group of scientists (headed by a Dr. Walton, natch) attempting to reanimate the dead with a serum. After struggling for three years, they have a breakthrough after resurrecting a dog. Even though the dog acts oddly aggressive (‘sup, Pet Sematary? ), the group is rightfully excited by their discovery. Unfortunately, a biometrics corporation manipulates the wording in the group’s grant contract and lays claim to their work in a siege led by Ray Wise (who is around long enough for you to exclaim, “hey, Ray Wise!”). Desperate to salvage their project, they break back into the lab to restage the experiment and record it, only to meet with tragedy when lead scientist Zoe (Olivia Wilde) is electrocuted to death. You know the rest, which wouldn't be a crippling problem if the film didn't ruthlessly play to expectations: Zoe is revived, only she’s definitely not herself after the ordeal unlocks the other 90% of her brain. Yeah, that old chestnut is rolled out, making The Lazarus Effect an ill-timed retread in light of Lucy, which at least had the benefit of Luc Besson and Scarlet Johansson. Not that The Lazarus Effect is lacking talent, mind you. Its director, David Galeb, helmed Jiro Dreams of Sushi, and its cast is rounded out by the likes of Mark Duplass, Donald Glover, and Evan Peters. The real difference between these two productions is that one studio allowed its filmmakers to follow their insane impulses, while the other stifled any fascinating choices and stuffed them into a box fit for mass consumption. Which is to say The Lazarus Effect at least has some notions before it’s reduced to mechanical reflexes that parrot familiar motions and plot points. For a few brief moments, it actually ponders the metaphysical implications of its situation. Sure, it’s clumsily mused over with cliché dialogue involving the clash between science and religion (all while Zoe clutches her cross necklace), but the film explores some interesting territory once Zoe returns to life with visions from her death. It turns out that hell is a very real, existentially terrifying loop that forces you to relive your worst memory in perpetuity. Zoe describes it as being stuck in a dream, and Galeb appropriately shoots it like a nightmare inspired by The Shining, complete with ghastly little girls and tracking shots that creep down fiery, blood-red corridors. These precious few sequences are stark departures from the rest of the film, which is a rote exercise in predictable jump scares and tame gore. Once the film completely gives itself over to the latter, it’s especially disappointing because watching Olivia Wilde savagely murder people should be either more disturbing or fun than it is here. She is quite terrific at obliging for either mode. When the film paints Zoe as a Frankenstein’s monster who never asked to be reborn without a soul, Wilde is effectively dead-eyed but sympathetic, and, when the film suddenly shift gears and portrays her as unhinged psycho, she’s a delightfully wild-eyed scenery-chewer with a wink that could kill. It’s too bad she’s hamstrung every step of the way: the film doesn’t care enough about her character to fully explore the former, and it’s far too tame for the latter to flourish in a fallow PG-13 landscape. 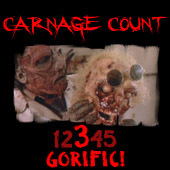 If your film must degenerate into a mindless gore-fest, actual gore is preferable. You don’t sit in the front row of a Gallagher show and expect not to get wet. As such, The Lazarus Effect only feels like it should be nastier than it actually is. There’s an irony to be found in a film that involves corporate overreach when it feels like a victim of the very same thing. Anything that’s remotely subversive or intriguing about it is smoothed out like a rough edge so it can safely fit in a multiplex. This is true right down to its closing moments, when a cool inversion on the typical gender dynamics of the Frankenstein story is just fodder for a smash cut to the credits, a predicable final note for a film that hums a familiar tune for an audience that knows all of its beats. The only fear you sense here is on the part of Blumhouse, a studio that seems increasingly hesitant on churning out anything that isn’t bland product. Once a haven for filmmakers (from James Wan to Rob Zombie) to run wild, it’s become less a workshop and more of a factory during the past year (at least within the realm of wide-release horror). It’s a disheartening trend because horror can’t be diluted or safe—it should provoke, disturb, and upset. At the very least, it should entertain, even if the thrills are cheap. You should let your monster loose, not neuter it. Forget its lack of a pulse—The Lazarus Effect could use some more balls first and foremost. Rent it!